An interesting point I always like to make about my career is that almost every one of my jobs, and my companies (I’ve had 2), has been built upon relationships and networking. The ability to connect with people on common ground, and then leverage those relationships, has been a huge part of tapping into new opportunities, attracting customers, and building a business. I was chatting with an old friend from Boston University this morning who recently launched a consulting business for startups and tech companies in Boston. We were talking about the ups and downs of entrepreneurship, marketing, and growing the business in general. I told her that the single biggest driver of business for me, over 30%, is referrals; mostly from other clients, but also colleagues, friends and acquaintances who know and understand my business, and like me enough to recommend my work. And while it’s a great testament to the quality of my service, it’s an even bigger testament to the true power of networking and relationship building. This is particularly important for job seekers, as much as it is for freelancers and independent business owners. Sure, there’s the “hidden job market” aspect, where close to 90% of jobs aren’t even advertised, and that’s true. But even when a job is openly advertised, the first place people go to search for qualified candidates, is to their own networks. My husband’s company pays upwards of $5,000 in bonus for referring a new hire. I’ve heard of other places paying twice that for high-level folks. This is because companies value credible, informed referrals from people they trust, who can vouch for the quality of someone else’s work before they even get in the door for an interview. It saves time. And even if there’s no monetary incentive involved, I’d be much more likely to initially recommend someone in my own network who made the effort to stay on my radar and whose work I’m familiar with. Be ready to tell someone what they can do for you if they offer up the help. Saying you’re looking for work isn’t enough. But giving them a brief overview of your expertise, what kinds of companies you’re targeting, and what you can bring to the table will help them keep you in mind should something that fits your description come across their radar. Remember – they have to potentially be able to explain to their higher ups what you do and why you’re a good prospect, so give them the tools they need to be able to do so. When I connect with another business owner, I always make it a point to ask and get clear on who their target customer is so that I can keep an eye for interesting people to connect them with. People will want to help you even more if they see you taking a genuine interest in what they do. You might not be able to get them a job, but you can send an interesting article or resource that references back to a challenge, need or interest they have. People have busy lives, and if you don’t put yourself out there and let people know that you’re looking, you are likely passing up valuable opportunities to connect with key people. Don’t assume that because your friends, family and Facebook network are close to you that they know what you do, much less how to communicate it to someone else. My parents like to tell people that “Dana has her own company,” but I suspect that’s about as much detail as they can comfortably go into. People want to help, so let them. The worst they can do is ignore you. 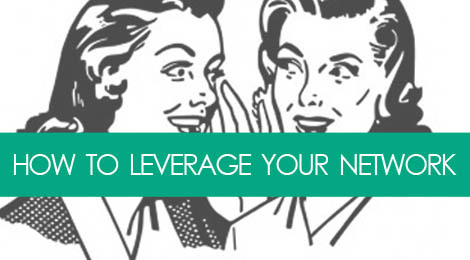 One of the quickest ways to build your network is by tapping into someone else’s. As I always say, think like a small business – who do you know in your network whose expertise compliments yours, and whom you might be able to partner with on interesting projects? This could include blogging, sharing each other’s content, or simply setting up a casual lunch or happy hour date to introduce one another to people in your separate social/professional circles. As I said before, networking isn’t just something you do during your job search. It’s about taking the steps to build a solid professional foundation that you can leverage to move forward throughout your career. Joe Smith may not be, or know, a hiring manager at that sweet design agency, but that doesn’t mean he won’t refer you a major client whose business plays an instrumental role in you being considered for a promotion. Or preserving your job during an unexpected round of layoffs. It’s as simple as this: always be open to meeting people, to listening to what they have to say, and looking for common ground on which to keep the conversation going. This cyclical process of reciprocation is part of what keeps business going and growing, and as a job seeker, you can be tapping into that wealth to manage your own success. Tags: career, communication, job search, marketing, networking, shameless self promotion. Bookmark the permalink.